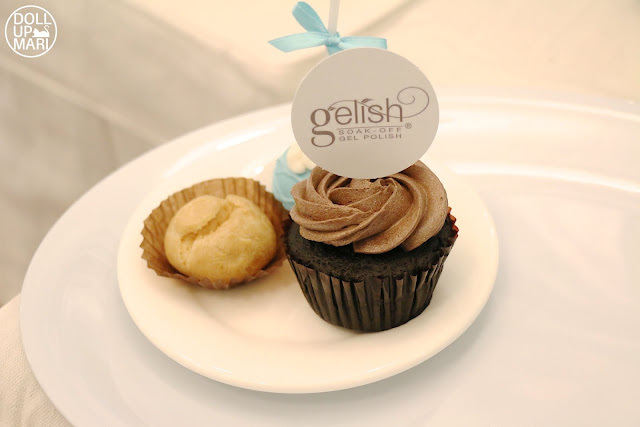 Twas a match made in heaven when Nailaholics formally celebrated the forging of their union with Gelish as their official gel nail solutions provider! This event was on September 28, and my flight back home from Korea came back Sept. 28 morning (I got back home at 2AM-ish), so this was a nice way to sort of unwind after the tiring trip back home. For those who have been noticing my nails, I think you do know that I am currently on hard gel nails, and as such, learning about gel was interesting to me. I went to the Nailaholics branch in Araneta Gateway. This is in the fourth floor alongside salons and other esthetic centers, and I think the wing that this place is in is not so easy to find so I think it's best to ask the information desk early on in order to save time. 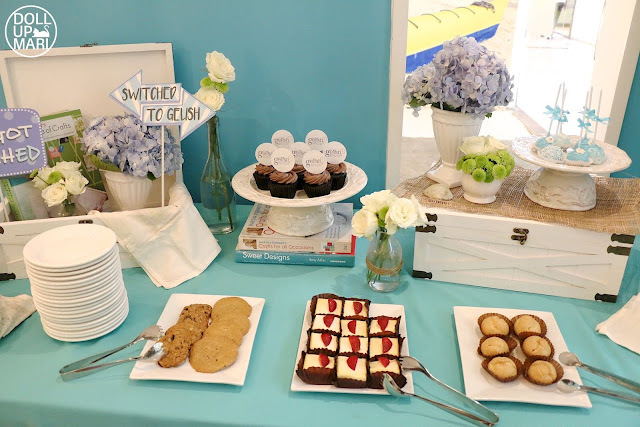 They had a little sweets table going on to keep guests munching while getting pampered. This chocolate cupcake was the best one I've tried in history (aside from mine wahaha) I am actually curious now as to who baked these. And so let's get to the icky part. So my toenails have been neglected for like 10 eons or so hahaha. I put this pink polish last August and just kept on patching it up whenever something got off. I was too lazy and in a dilemma of having not a lot of acetone to remove and then legitimately re do the polish. My 1 week in chilly Korea also meant that I was in sneakers the whole time so I think the layers and layers of already crusty nail polish gave up. So this is how they looked like before everything. So Rachel started with cleaning off the crusty nail polish and dealing with my ingrown toenails and dried skin flakes. I commend her for being able to face such horrors and live through it. And then they proceeded to put on the Gelish base coat and cure it. Their lamp is something they really pride over because it has a door, The silver thing you see can be lifted and lowered down, so they claim that their gel services can be used by pregnant women (although I carefully say the word 'claim' as this was mentioned to me in casual conversation and there was no formal statement or proclamation from a medical body or authority over this). However, the door is a welcome addition because I sometimes find the LED light from these kinds of lamps as too glaring. I chose the shade 'Rule the Runway' from the Sweetheart Squadron collection. This is a purplish grey shade, though it may look as a greenish gray at first glance. This new collection that they have consists of pretty coral pinks, deep reds, and greys like this. So from the multi crust peeled off desperately horrible pink nails I had, I now have these super cute and classy grey toenails! Please don't mind the reddish mark on my left big toe it's just discoloration it's not a wound. As I write this, my toenails still look as good as they did in this photo and there seems to be no signs of stopping. I like how despite my daily sock habit, the gel doesn't peel off. For my manicure, this is what got me super curious. I am on hard gel and I asked beforehand if they'd be able to remove it. I was told yes, but I already had an inkling that they had gel polish (which is soakable) in mind, not hard gel, which requires a sanding machine to file off and can only be soaked off once filed to a thin enough level. And true enough, they didn't have the sanding machine necessary for complete removal. But, beforehand, I had already thought this out and I had wanted to experiment as to how this brand would react with my hard gel so I wasn't bothered by their lack of machine. I have tried other brands of gel polish over my hard gel nails and what happens is the gel polish just bubbles, puckers up, then peels off and leaves a whole sticky mess. So today is indeed an adventure. They didn't remove my hard gel but instead they used a file as per my request to thin it a little bit so that the nails would be rough enough to be able to enable to the gel polish to adhere. Their own take is that gel polish will have its own thickness, too, so they thought it was important to file off my nails. So here is Maine trying out the base coat on me. You can actually see all the glitters on my nails, just dulled out due to the filing. My glitters are placed halfway so to reach the glitters requires too much unnecessary labor, more so when the opaque polish will cover it anyways. And I use the machine again. As a gel user I personally like this machine for the door because it's a thing in the gel world that lamps do lose their brightness over time. Like each lamp is only destined for X uses, and will dull out over time. This is why most Western lamp manufacturers make lamps that do not have continuous lighting (i.e. you have to press a button to make it light for a certain period of time, and then it dies off again). I feel like the door helps to prolong the owner's usage as the light doesn't keep on "escaping" per se. But yeah this is just me hahaha. Maine was busy over my manicure. It was honestly so amusing because behind this striped curtain you see is the staff rest area. The staff kept on peeking out the whole time because as far as I know, this is the first time they've seen someone with hard gel nails come over to do this. 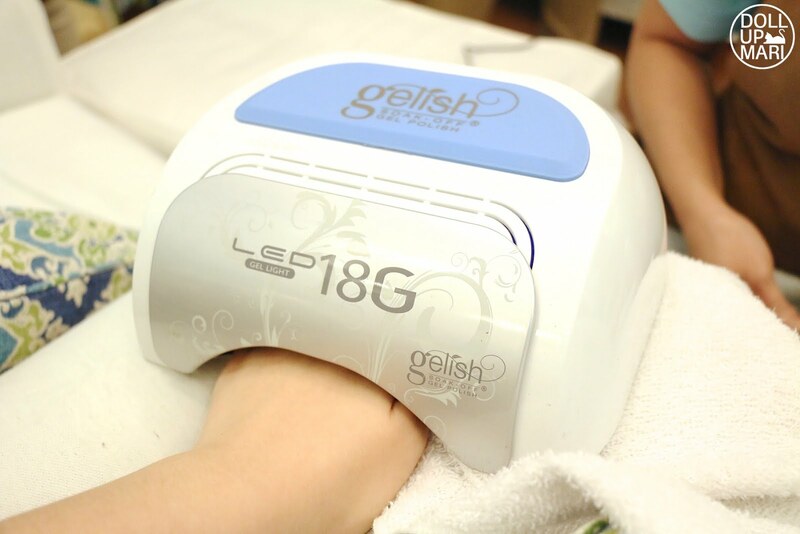 They are experts on gel polish, but hard gel is totally different from gel polish. You can see Maine apply polish on me just like the usual way we apply polish, making careful strokes so it applies in a desirable thickness and goes on evenly. For hard gel, you literally have this goo that you pile on top of the nail like whipped cream and cure. And then you need to buff and shape and everything. And my nails are usually 3-4mm thick at a time. So yeah, for those who are wondering, that's the explanation. I think most of them are just about to be sent to training for hard gel so I kinda see it in the near future of this nail salon. So this is how it looks like after the first layer of color. It's still not 100% opaque, which is normal as they usually do use two or three coats depending on the situation. What is noteworthy though is that this gel has a high cure rate, though this is something that the salon or user will benefit more from rather than the consumer hahaha. After every layer is cured, anyone who has tried gel knows that it's sticky and gooey. This is because by default, regardless of the brand, not 100% of the gel applied gets cured all the time. A high cure rate, though, means that the salon can use less product and get more mileage because more of the product is cured (which is especially important when it comes to hard gel). It also means that the gel's integrity is already established in the salon and will make the nail less likely to chip off early on. It also potentially brings in more comfort for the consumer if ever they are so tempted to touch the nail because the nail is not as sticky as compared to when a gel product of low curing rate was used. The sun is another thing that cures the gel and "strengthens" it over time, but a high cure rate from the get go is a desirable quality. Gelish is noticeably doing well in this aspect as the gel is not very sticky after drying. As blurry as this photo, this is how happy Maine is after finishing. She was sooo fascinated over my hard gel nails hahaha. And this is how it looks after. So yeah, your nails will not go from stubby to this with gel polish. You'll need hard gel nail extensions for that. But if you want a polish that will not fail you in life's most important moments, then you need to get this done. Despite being in a less crowded area of the mall, the salon was brimming with customers. Aaand for those who are curious, Gelish comes in like a hundred shades (although it will take Nailaholics some time to be able to get all the hundred shades because gel polish isn't cheap mehehe). There's this red one here. There are also the light pink ones like this. I also saw greys, blues, turquoises, glittery ones, etc..
And yes this is the whole collection. Whenever a nail product manufacturer comes up with a gel polish, they will also come up with a regular nail polish of the same shade, and they call it "color matching". This is done for many reasons, I'm sure, but my best guess is because people will more likely invest on gel manicures over pedicures but still want to have the same shade. So to make it economical for the customer, this is the set up they have. The perfect end to any gel session is to be treated to a luxurious nail oil. Some people have cuticles that dry up like crazy after gel so they really need nail oil after the session. For me, I just like it for the pampering effects. This nail oil they have has a very woodsy and herbal fragrance which I think a lot of people will deem as relaxing. I like that they have it in a nail polish bottle because from the perspective of a salon owner, wastage is reduced compared to nail oils that are dispensed in droppers. This shade was sooo pretty and I got a lot of compliments over it! 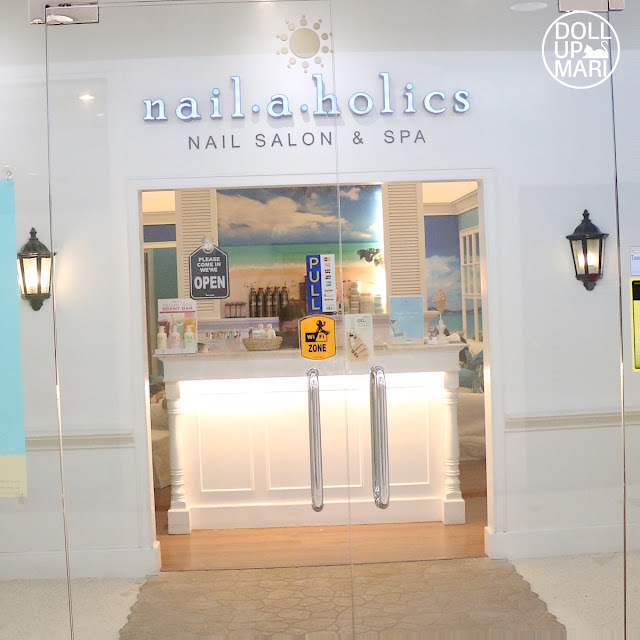 I personally can go straight to Gelish since I do my own gel nails, but for the rest of the population, it's high time to head on down to Nailaholics to get pampered! For those who are curious, I was told that the gel manicure is at 800 ish while the gel pedicure is at 900 ish. The manicure can last over real nails for weeks, I was told. Though on hard gel it lasts even longer (like it will only get off once I remove the hard gel with my machine). I was told that the gel itself is more or less at 700 ish with color matched normal nail polish, but I am not sure if Gelish sells to consumers (as they might exclusively be selling to salons only). Zenutrients Now In Sample Room! Silka Avocado Now in Sample Room! I'm a Cuccio Girl and I Love It!